The Lady Diablo Edge is the most weight-efficient titanium driver that Callaway has ever made. It has a four-piece modular design that moves the bulk of the weight to the back of the club. Every piece of the club is precision-formed and fused together to give this club an extremely high MOI and a low center of gravity. 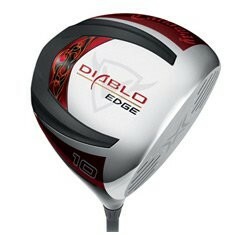 In addition, I really like the red modern graphics and traditionally-shaped driver head. It looks good at address, and the large face will give you lots of confidence at address. This driver will definitely give you added yards, especially on miss hits. However, one thing I'm not a big fan of is the sound of the club at impact. It's a bit tinny. Also, there is no alignment aid on the club to help you set up at address. I would recommend that you take a look at the Women's Burner Driver 2009. This is the same size with an extremely large hitting surface. I also like the TaylorMade Lady R9 Supertri Driver because you can adjust the driver head to your swing. Adjust it closed to help you square the driver, and after you improve, adjust it back to neutral.